Compliance Isn’t Easy. PharmaTouch Is. PharmaTouch delivers solutions and services for better, easier compliance in the pharmaceutical industry. Need to manage a speaker bureau program in an efficient way that ensures great events while demonstrating adherence to regulations? Struggling with how best to handle your physician relationships and track spend? Or maybe you need to tackle challenges with data quality and system interoperability in order to ensure compliance across a wide range of areas. Whatever the case, PharmaTouch gets you there with offerings that help drive success – for you, the medical professionals you work with, and most of all, for the customers you serve. Manage speakers and events in a compliant way that ensures successful events. Screen and validate healthcare providers to ensure compliance. Aggregate data and orchestrate workflows to drive down compliance cost. Educate your workforce to keep pace with regulatory change. Get the most out of your processes and technology. 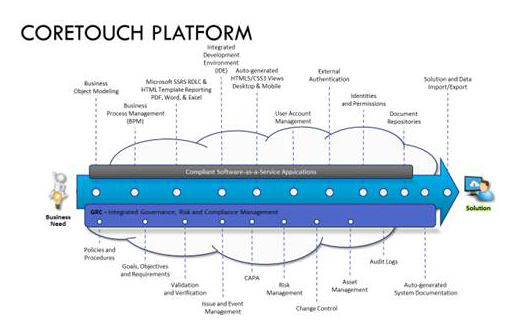 Underlying all of the solutions we deliver is the PharmaTouch CoreTouch Cloud Platform. Representing leading-edge software-as-a-service technology, this platform includes sophisticated tools for business object modeling and process management – along with a flexible integrated development environment.